I don’t know about you, but I can never leave anything half-baked. Whether it be projects or pies, I want to make sure I get them just right. These past few weeks I have been perfecting, perfecting, perfecting. I am currently job searching so I am constantly revising my resume, trying to get just the right words on paper that will make an employer say “ooo”. I have also been involved with a local community theatre production of Urinetown the musical and have been focused on the perfect performance for each audience. 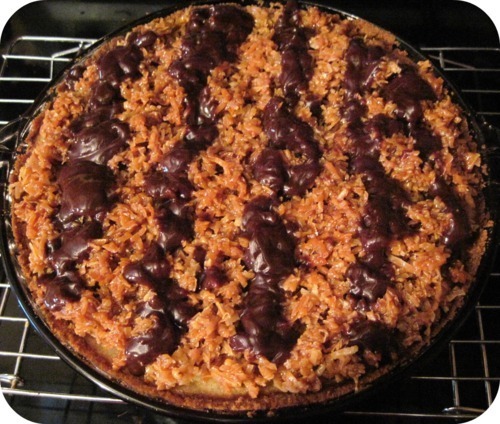 Meanwhile, I have been trying to perfect a Caramel Chocolate Coconut Cookie Mind E’splosion Pie (which bears a large resemblance to a Samoa cookie sold by those little seemingly innocent purveyors of evil addictive cookie sweetness). Having missed out on the local girls taking cookie orders, I decided to make my own Samoas. In fact, I decided to one-up them and make a Samoa cookie PIE…and not one of those pies that just use Samoa cookies…a pie that would resemble a GIANT COOKIE. Don’t tell anyone I’m pretending a Bobby Flay Samoa throw down with some 8 year olds. I tested each version of this pie with the biggest Samoa cookie addicts I know. Each version was yummy, yummy, omg, but wasn’t quite right. Third time’s the charm and this super-sized turbo version of a French Coconut Pie came out the victor. Don’t be afraid of all the ingredients…I found it less daunting if I made the caramel and toasted coconut the night before. The rest of the steps just flow like buttah. Enjoy, my little cookie fiends! Mix vanilla wafer crumbs, sugar and butter together until it clumps together and can easily be molded. Use cold butter to butter a 9’ pie pan and press the cookie mixture into the pan. Put in the refrigerator to chill. Preheat oven to 350 degrees Fahrenheit. In a large bowl, combine melted butter, eggs, flour, sugar, 1 cup of the toasted coconut, cream of coconut and milk. Take pie shell out of the fridge and spread the semi-sweet chocolate chips into a single layer in the bottom of the crust. Pour coconut mixture gently into pie shell. Bake until firm, about 45 to 60 minutes. Highly recommend a crust guard (which you can make out of tinfoil) after the first 15 minutes to prevent the outer edge from burning. Let pie cool for at least two hours after it finishes baking. Heat caramel in the microwave if made in advance. Mix warm caramel into the remaining toasted coconut and spread as a thin layer on top of the pie. In a small sauce pan, combine the sugar and 1/2 cup cream. Bring to a boil, stirring to dissolve sugar. Lower heat immediately and simmer, without stirring, 5-6 minutes until slightly thick and pale yellow. Remove from heat and stir in butter and chocolate until melted. Let chocolate mixture cool slightly. Pour in stripes on the top of the pie. Allow pie to completely cool. If refrigerated, allow to come to room temperature or else the caramel will be too tough to chew!